To see Ray Lee Wood quietly and But that he was. As a tire changer for the famed Wood Brothers crew, Ray Lee Wood helped send many of the sport’s top drivers to victory in some of the sport’s premier events. But it was during a race trip that brought his family team world-wide acclaim that Wood realized it was time to change life courses. At the same time he and his brothers were shocking the auto racing world with their pit work that helped propel Jim Clark to victory in the 1965 Indianapolis 500, Ray Lee Wood was realizing that his racing days were coming to an end. It was the same calling his brother Delano, the family jack man, would feel at the end of the 1983 season. Not wanting to leave his brothers in mid-season, in an era when good tire changers were hard to find, Ray Lee decided to stay on through the end of that year. 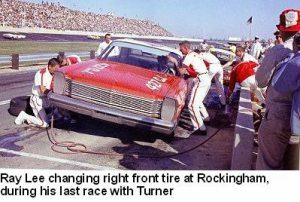 His racing career ended in grand style, with his old friend Curtis Turner driving the Woods’ Ford to victory in the inaugural American 500 at North Carolina Speedway in Rockingham. It was one of the great moments in NASCAR history as Turner was considered by many to be past his prime, too old to win a grueling 500-mile race. From then on, instead of spending his Sundays at the race track, Ray Lee Wood spent them at the Pentecostal Holiness church just down from his home in Buffalo Ridge, just north of the Stuart, where the family’s race team was based. Now age 82 and retired from the grading business, he tends the family farm and lives in the same house his parents moved into when he was about 14 years old. The well-tended yard and tin-roofed, white-frame home, with the mountain stream out front winding among giant hardwood shade trees, look like a scene from an earlier, simpler time. “There’s just something about this old home place,” Wood said of his love for his little part of the world, adding that he tries hard to make his kin feel just at home there as he does. It’s in his front yard that the Wood clan gathers each year, under an old beech tree, for their family reunion. “Even though it’s been mine for some time, I tell the family that I want them to always feel like it’s home for them too,” he said. Wood, who never married, lives there alone, but says he’s never lonely. “The Lord’s always there, and you can always talk to him,” he said. He’s also got his TV and radio, so he can keep up with the NASCAR races, especially when the No. 21 Motorcraft/Quick Lane Ford Fusion is competing. “I still follow it,” he said. And when visitors press him for stories from his racing days, he’s always glad to oblige. Many of his racing tales involve Turner, his fellow Virginian. Although Turner was a legendary partier, Wood never participated in those excursions. However, he often hitched a ride in Turner’s plane. Since he wasn’t a full-time racer, it was important for Wood to get home as quickly as possible after a Sunday race and get back on his bulldozer. Since Turner often was flying back to Virginia, Wood would ride along. Wood’s just as interesting when talking about his bees or his garden. Just as his brothers Glen and Leonard – and the team mechanics today – are meticulous and thorough in the preparation of their race cars, Ray Lee leaves nothing to chance when tending his bee hives. Since he began keeping bees 50 years ago, each year he ensures that his boxes in good order, and he faithfully treats his bees for a myriad of problems that are plaguing bees everywhere these days. 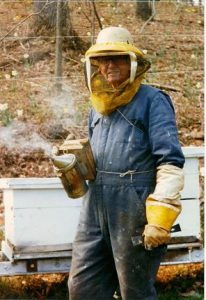 Recently he harvested honey from his 100 hives, taking only the sourwood, the most popular flavor, leaving plenty of poplar and other less popular flavors for his bees to live on over the winter. Not surprisingly, Wood’s honey crop, 100 or so cases, is mostly spoken for already. Its popularity extends far beyond the quiet community where he resides. Some has been shipped as far away as Japan. Just as his brothers continued to find success on the race track after he left pit road, Ray Lee Wood has had bountiful harvests at home. When the Wood family gathers, there is much to be thankful for.